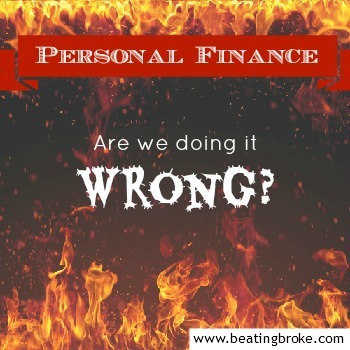 Are We Doing Personal Finance Wrong? As you can probably imagine, as a personal finance writer, I think about personal finance quite a bit. Often enough that I write several articles a week on the subject. I don’t consider myself an expert, but I do think that I know a great deal about it. And I’m beginning to wonder if we aren’t going about it in the wrong way. We rail on the Joneses constantly. That, by itself, isn’t really a problem. The Joneses just aren’t very smart with their money. But, for all that we rail on them, we spend an inordinate amount of time trying to find ways that we can go about having things that are similar to what they have for less money. And that is the problem. The Joneses have the fancy cable television package? Try Netflix, Hulu, or Amazon Prime! The Joneses have a fancy new car? Try a newer off-lease car! The payments are half what they pay, and the car is almost as nice! The Joneses have a fancy house? Try making it affordable by DIY, gardening, and renting out a few of the rooms! We aren’t the Joneses. We know that. We know that we really don’t want to be the Joneses. But, some part of our natural tendencies somehow pulls us back to them, time and again. We strain hard to become less like them, and find ourselves back where they are. That is the problem with personal finance. Maybe the issue isn’t the Joneses. Maybe, just maybe, it’s us. I alluded a little to this recently (The Joneses and Jealousy), when I suggested that our tribal human history pulls us towards the leaders of our “tribe”, and that we should be looking for a new “tribe” that espouses the same values that we do. I think that we all end up returning to our Joneses because we haven’t fully made that switch yet. Because we’re afraid of what the rest of our tribe might think. What our families might think. Heck, what our spouses might think. And, maybe all this frugality and saving aren’t really what we’re looking for. After all, where does that lead us? A cheaper version of the Joneses lifestyle? Isn’t that what we’re pushing away from? I think what we are really looking for, and what we are really jealous of the Joneses for is financial freedom. It may only be perceived in the case of the Joneses, but it’s still there. Freedom, financially, to be able to do the things we want to do, go the places we want to go, and have the things we want to have. We emulate those who have those things without giving much thought to how they got there. Maybe the Joneses did it through a boat load of debt. We rail against debt. Which only gets us so far. So many of us struggle with even that part of it. I know I have, and sometimes still do. But, I can tell you with certainty, that had my perception of debt not changed drastically from where it was when I began this journey, I would be in a far worse place than I am now. But, even that is only one small change in the way I think about personal finance. Our entire perception has to change. What’s the personal finance endgame? What is it that we are really looking for. We decide we want to change how we handle our finances, abandon the way of the Joneses, and make our way to a better life. But, what is that better life? If you’re thinking that a secure retirement is it, I think you’re wrong. I think there’s a better way. There has to be. HAS TO BE. There has to be a better way that doesn’t involve working for 40+ years, pinching every penny, saving every dime, only to end up at 65 or 70 with enough money to make sure you can pay for the medical bills your advanced age brings with it without having to live on welfare. That can’t be all there is to personal finance, is it? My word. What if you retire at 65, and die at 66? I submit to you, that what we are really looking for is personal finance independence. We don’t want to have to count on a job. We don’t want to count on a paycheck to (hopefully) cover the bills this month. What is personal finance independence? Here’s the tricky part. I think it’s going to vary based on the individual. What personal finance independence means to you is likely going to be a bit different from what it means to me. Take, for example, Jacob. Maybe you’ve heard of him, maybe you haven’t. He writes a blog about early retirement. He wrote a book all about it. It’s got more scientific content than some of the science books I remember from school. They guy is crazy smart about the subject. But, when he says it’s early retirement extreme, he’s dead right. If going to the measures that he went to in order to retire early is what is required, count me out. In fact, it seemed for a long time that it was either extreme or not. Nobody had really talked much about the in-between area. Enter Mr. Money Mustache. He, too, retired early. And, while he has his extremities, it’s not quite the same thing. It’s different for each and every person. What one person thinks of as retirement isn’t what someone else will think of. Heck, most of us have been so pre-conditioned to think that retirement should consist of afternoons golfing followed by bingo down at the VFW that it’s no surprise that we scoff at people like Jacob and MMM. Oh. Well, the truth is, I just don’t know. I think that, with a little help from the Jacobs and MMMs of the world, and a little trial and error, we can find our own personal finance independence. I think that we can take what we learn, adapt it to our lives, and make something brilliantly wonderful out of it. I know we can. We just have to try. We just have to change personal finance as we know it, and embrace something better. When many of us think of retirement, we think of some far off time in our future when we’ve saved enough money and reached an age where the government will allow us to withdraw our money without significant penalties. When Jacob Lund Fisker thinks about retirement, he’s thinking about the here and now. You see, Jacob retired when he was 33. How? By following the principles that he outlines in the book. What this book has done for me is to turn much of what I thought about personal finance on it’s head. At this point, I can’t say whether I will attempt to try and join the ERE army or not, but I can guarantee you that I will be looking at things from a different point of view from here on out. The book itself is dense. Dense in that it’s packed full of information. There’s no way that one read through will be enough. You’ve either got to read it several times, or supplement that first reading with plenty of reading of Jacob’s blog. It reads (the book, not the blog) much like a textbook does. It’s even segmented into sections the way a textbook would be. Luckily, it’s not all facts and figures and there’s a bit of discernible humanity in there as well. Jacob lays out how he managed to retire at 33 by some extreme saving. Then he goes into how he lives off of less than $10,000 a year that he draws from his investments and a few odd jobs (that he enjoys) during the year. By no means is the Early Retirement Extreme going to be for everyone. It’s a hard read. But, it is well worth the read. It’s the “thinking man”s personal finance book. It’s not chock full of anecdotal evidence, but raw hard facts and numbers. It will change the way you think about personal finance, and life in general.